Q-Connect Polypropylene Name Business Card Holder 96 Card Black KF03663 Pack of 1 Business card holder for a stylish and practical solution to card storage. Eliminates the possibility of accidental damage. Makes finding business contacts simple. Transparent plastic reduces the need to handle your cards. Holds up to 96 cards. Black. Q-Connect Polypropylene Name Business Card Holder 160 Card Black KF03664 Pack of 1 Business card holder for a stylish and practical solution to card storage. Eliminates the possibility of accidental damage. Makes finding business contacts simple. Transparent plastic reduces the need to handle your cards. Holds up to 160 cards. Black. 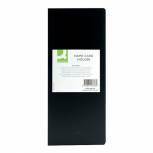 Guildhall Classic Business Card Holder 128 Card Black CBC4P Pack of 1 Goldline Business Card Holder. Classic grained, PVC covered business card holder. Contains 16 pages (4 pockets per side) holding a total of 128 cards. Size: 280mmx110mm. Colour - Black. 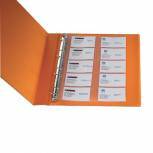 Q-Connect Punched Business Card Pocket 20 Card Polypropylene A4 (Pack of 10) KF00716 Pack of 1 A4 pockets with 10 compartments. Will accommodate 20 business cards. Durable. 80 micron. Multi-punched to fit most ring binders. Pack of 10. Goldline Black Deluxe Stitched Business Card Holder 96 Card Capacity SBC3P/BLK Pack of 1 Goldline Business Card Holder. Deluxe stitched, lightly grained PVC covered business card holder, with silk effect soft plastic lining. Contains 16 pages (3 pockets per side) holding a total of 96 cards. Size: 115mmx214mm. Colour - Black. 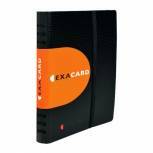 Exacompta Exactive Exacard Business Card Holder Capacity 120 Black 75034E Pack of 1 Exacompta Exacard business card file. Spiral bound polypropylene file made from 80% recycled material. Contains 20 clear pockets with three compartments in each pocket to accommodate 120 business cards. Includes A - Z index. 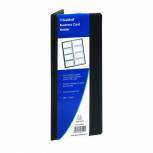 Durable Visifix Business Card Pockets Refill A4 (Pack of 10) 2389 Pack of 1 Refill for Durable Visifix Business Card Albums. Includes an extra 200 spaces for cards. Made from transparent polypropylene. For 57x90mm cards. Pack of 10 pockets. Size: A4. 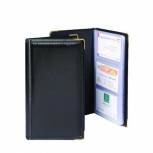 Durable Visifix Economy Business Card Album A4 2444/01 Pack of 1 Durable Visifix Economy Business Card Album. 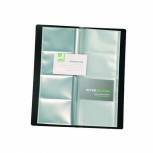 A4 ring binder with 20 pockets, for 400 business cards. Accepts 90 x 57mm cards. Complete with 12 part A - Z index.